This is the first update when I have sat down and thought "where do I start?" There has been so much going on with the development this month that it is hard to fit it all in a post here. Through the month we have steadily moved from working on our architectural changes, through to preparing for our first public test. The risks and gambles we took last year, are now beginning to pay serious dividends for us. One of our Lead Artists, Mario Kurty, has been working with some of the ArmA3 artists to ensure that DayZ Standalone has the best visuals possible. The result is pretty striking when combined with some of the other improvements we have made in the engine. These improvements make the world really come to life, improving the visuals overall. A comparison screenshot is included and demonstrates the effect of this. This has now been fully configured for use within DayZ, used to great effect in Bohemia's previous product Take on Helicopters (and coming in ArmA3 also). There are several pictures of this included in the screenshots for this blog update. Running around the world taking pictures, it was hard to resist really. It adds a real sense of realism when compared with the previous result. Our lead programmer, Ondřej Španěl, continues his work on redeveloping our server architecture. Contrary to some who say DayZ will be releasing with no anti-hack mechanisms, one of the key things we are doing with development is entirely redeveloping how the engine works. I can't stress enough just how fundamental this change is. 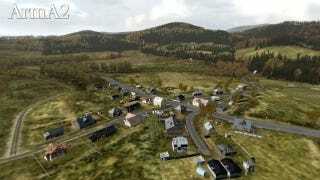 DayZ's game servers will function like servers in other MMO style games, that is the server will control the behavior and the sending of updates. No longer will your machine receive all the updates allowing their analysis by various cheats. We are exploring spawning all zombies and loot at the start of server initialization, again a huge departure from the previous mechanism. This solves many design and technical issues with the spawning and respawning of equipment, such as being able to metagame by telling whether players are in a village by seeing zombie's have spawned. This has now been completed to a basic level, you can put on and drop various items of clothing. These items can have diseases on them, and they have durability and other attributes. We need to make some models that represent the clothes when they are on the ground (currently they look as they are when on the ground!) Once this is done, we will be releasing some video outlining what it looks like to change your clothes. We have begun our internal closed testing (yes!) and have been working with Valve to ensure our new server browser system is working (we utilize Steam for this purpose rather than Gamespy as for ArmA2). The Server/Client architecture needs to be fully implemented before we will begin our public testing. We have not initiated our closed test that includes external people yet (such as streamers). A huge quantity of changes are flowing into the world. New areas, a mass of new objects (such as wrecked vehicles, buses, etc…) that are all designed with DayZ in mind—such as having good areas for loot to spawn. It is really impossible to list all the changes here, from bug fixing to redesigning of buildings such as the general store, and onto entirely new buildings and areas. One of our texture artists has been going through existing work and making them look more damaged and used. This is an area of very active development, we're exploring all sorts of ways to make your character change in the world as you play. When you first create your character, the options will be simple. As you go along in the world, your character will change as a result of their interactions with the environment and the decisions you make, through items such as clothing choices. Social aspects are extremely important to us, and we've taken a number of idea's and participated in the discussions on reddit and the forums about what we can do in this area. Expect more on these area's in the next tumblr update. We want to support the organic development and operation of groups within the game, through the development of their own symbology in game (tattoo's, markings on the world, on weapons, etc…). We feel that these redeveloped social experiences told through the game will be a compelling part of the standalone. Weapon attachments are a great bi-product of our entire redesign of every aspect of the inventory system. Nothing is available to show on this yet, currently the only attachment we have fully configured in the game is the magazine. You must load the magazine with ammunition and then it is considered an attachment to the weapon. The quantity and condition of your magazines will be particularly important in the standalone. Look after them! We don't know. We're going to take our time. I feel fantastic about the situation, more than ever I feel like we're doing something really interesting with this development. Now is not the time to rush things, but we do need to ensure our pace is kept up. Our development blog and getting players in and testing as soon as possible will be key in ensuring we succeed in making this a great game. At no point in development, have I been as excited as I am right now. The risks we took with the direction have paid off. The engine and approach of the game is now entirely DayZ's own, it is striking out into it's own territory as a project. This is very exciting for all the team. I do need to caution though, it is a bad idea to overhype the project. We know that there are many challenges that we will face from deciding to effectively write a new engine tailored to DayZ. But we are now entirely confident, that this decision will prove to have been the best decision we could make. Now we will be able to make the game that we've all always wanted. A welcome update, given that the last we'd heard, the standalone had been pushed back for an overhaul. It's nice to hear they're adding so much meat to the game. "But words are wind!" you might say. "We want screens!"